It’s that time of year again––we’re back for the playoffs to crown another goalie mask champion for the fourth year running. 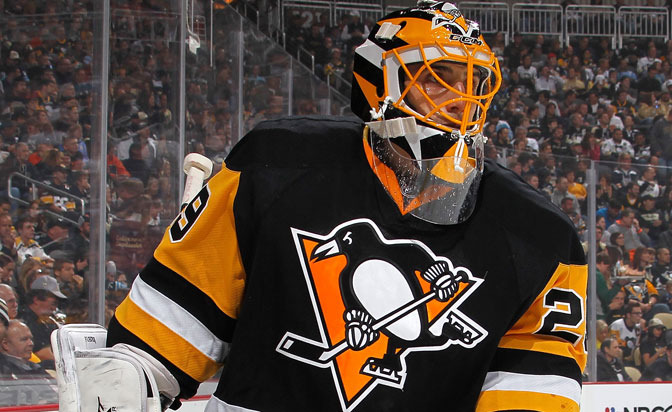 Last year’s victor Matt Murray returns to defend his title against some some new goaltenders (and new teams) who joined the mix. Like in past seasons, we’ll be pitting the starting goaltenders’ masks up against each other in matters of branding, composition, and overall aesthetic value. 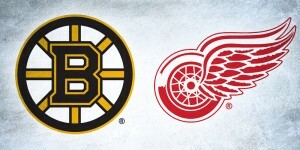 Will the conference quarterfinal round be one of sweeps or game-7 nail biters? We can’t make any promises about the actual playoffs, but at least in the bucket bracket, keep reading and find out! 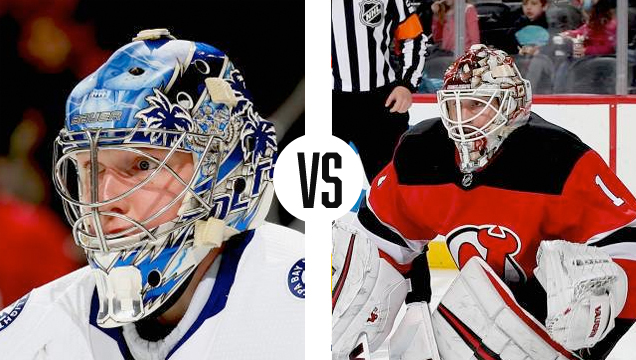 The first matchup of the 2018 Bucket Bracket Showdown pits Tampa Bay netminder and Vezina front-runner Andrei Vasilevskiy up against unlikely New Jersey backstop, Keith Kinkaid. 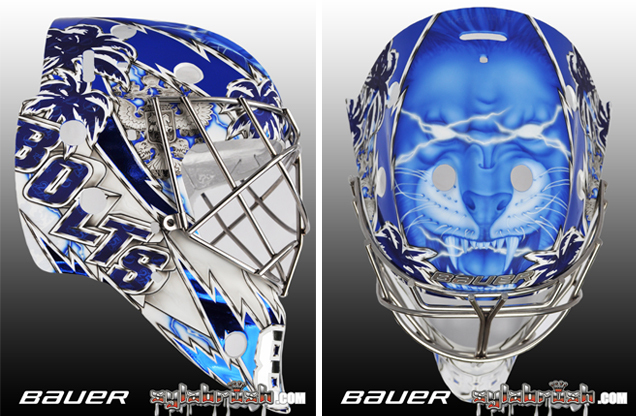 Vasy’s mask, painted by Sylabrush’s Sylvie Marsolais, turned heads last offseason for its mystical color changing technology. Marsolais has been one of the pioneers of “SubZero” and “Ghost” paint that cause the mask to change color when exposed to the cold or heat, respectively. 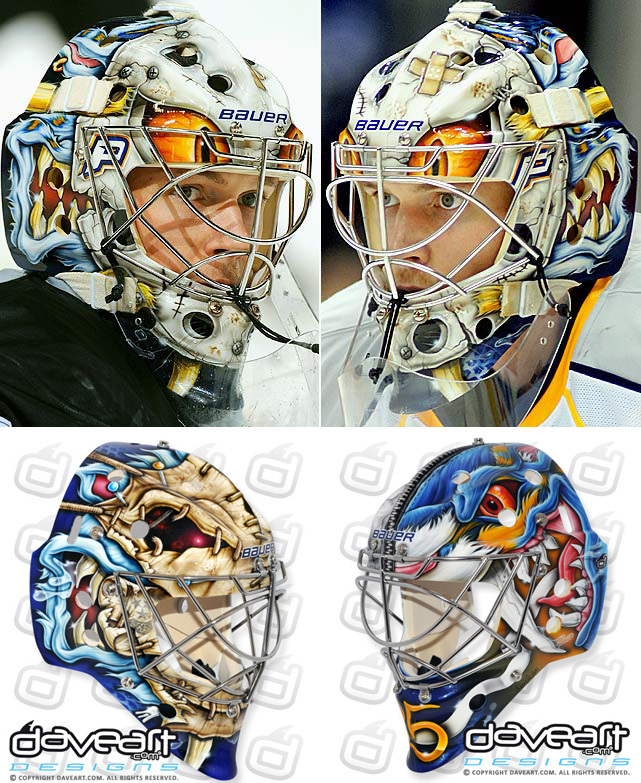 Special effects aside, Vasilevskiy’s mask has a pretty busy composition, which unfortunately causes Marsolais’ artistry and detail to get lost in the shuffle. However on the other side of the ice, Kincaid’s mask is quite busy itself. 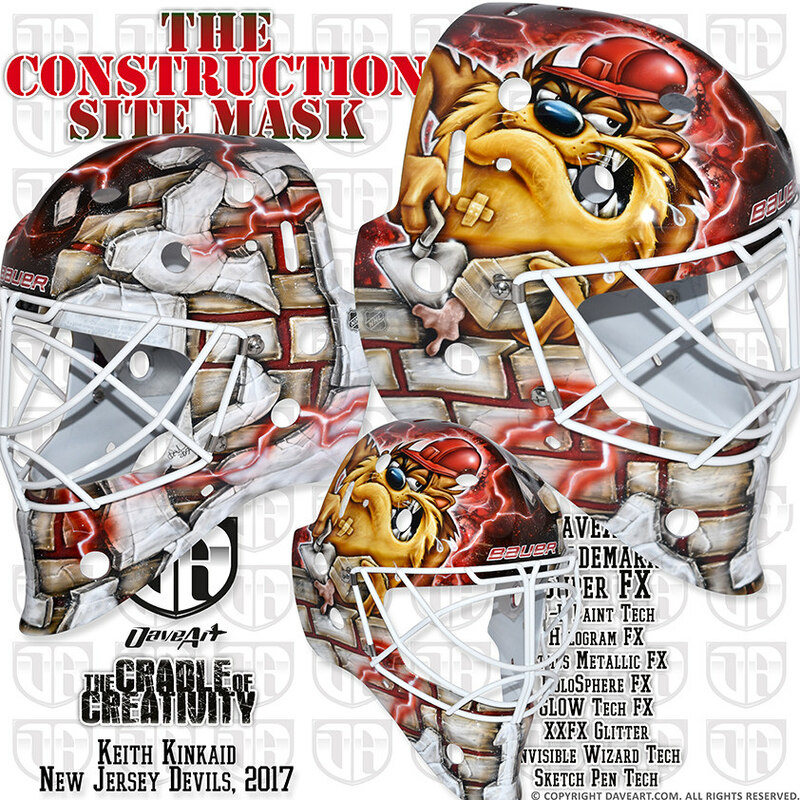 Titled “the construction site mask” by artist Dave Gunnarsson, this bucket includes pretty much every goalie mask cliche rolled into one – brick wall, lightning bolts, sinister looking cartoon character – the concept is a bit stale and lacks any kind of aesthetic punch. Despite the busy composition, the crispness of Vasy’s paint job gives Tampa Bay the advantage to take round one. 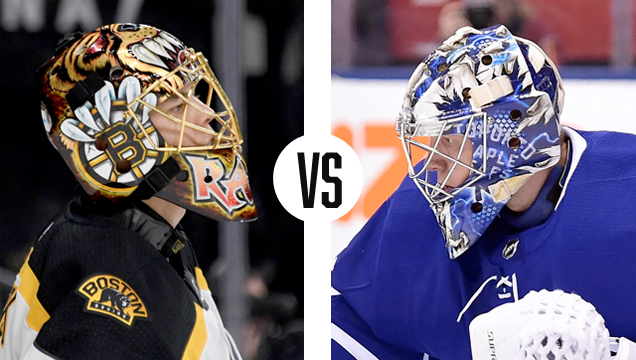 Next up in the east is Boston’s Tuukka Rask taking on Frederik Andersen and the Maple Leafs in my most anticipated series of the first round (but I may be biased). These two netminders have consistently embraced their teams’ branding in their buckets but with very different styles, so let’s first look at Rask’s. 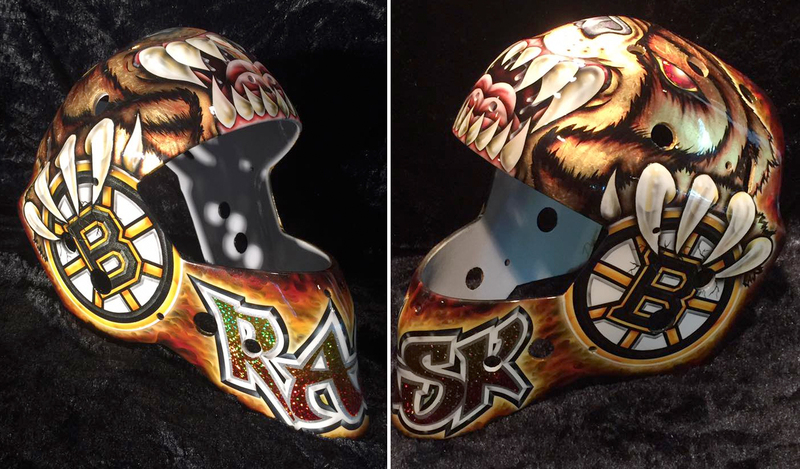 Painted by Massachusetts-based artist Ron Slater, Tuukka’s bucket has been the picture of consistency since his arrival in Boston from, ironically, Toronto. 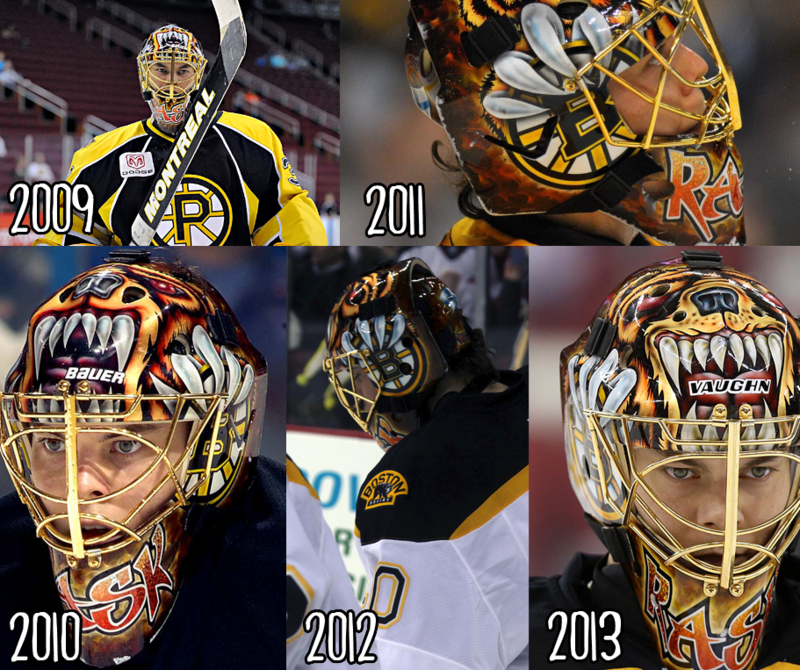 “Part of me wants to do something different for him,” Slater told us back in 2015, “but I think he’s kind of superstitious about stuff and doesn’t want a change either.” The gilded bear bucket has served Rask well over the years, incorporating the spoked-B on each side, centered by claws and a demonic bear face. His opponent, Frederik Andersen, has really embraced Toronto’s rebrand in his masks. 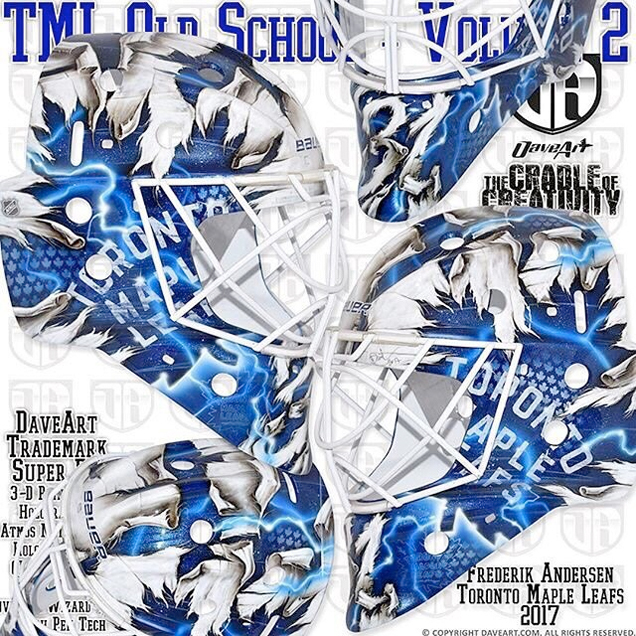 His most recent Daveart creation, titled “TML old school, volume 2” puts a high-tech, contemporary spin on the traditional Leafs brand, adding holograms, lightning strikes and loads of texture to a design that’s completely built around the logo. Both these goaltenders do a great job of capturing their team’s identity in a dynamic way, but the iconic and signature look of Rask’s gives him the slight edge. What would a Bucket Bracket Showdown be without an all-Daveart matchup? 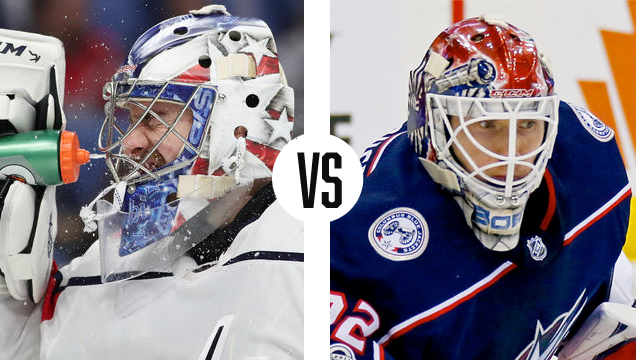 Two of Gunnarsson’s long time clients with red, white and blue masks face off in this series between Washington’s Phillip Grubauer and Sergei Bobrovsky in Columbus. 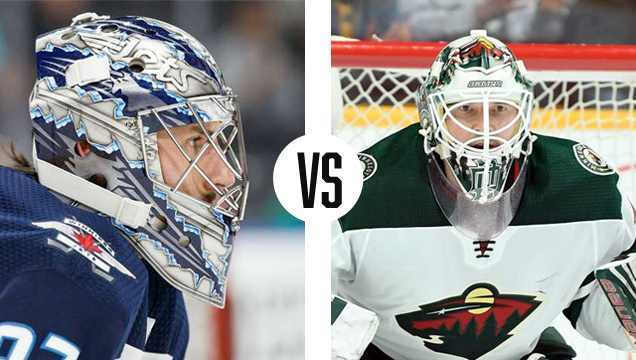 Both Grubauer and Bob have stayed fairly consistent in their bucket style throughout the years, and both showcase Gunnarsson’s signature style, making this matchup a close one to call due to the similarities in their masks. 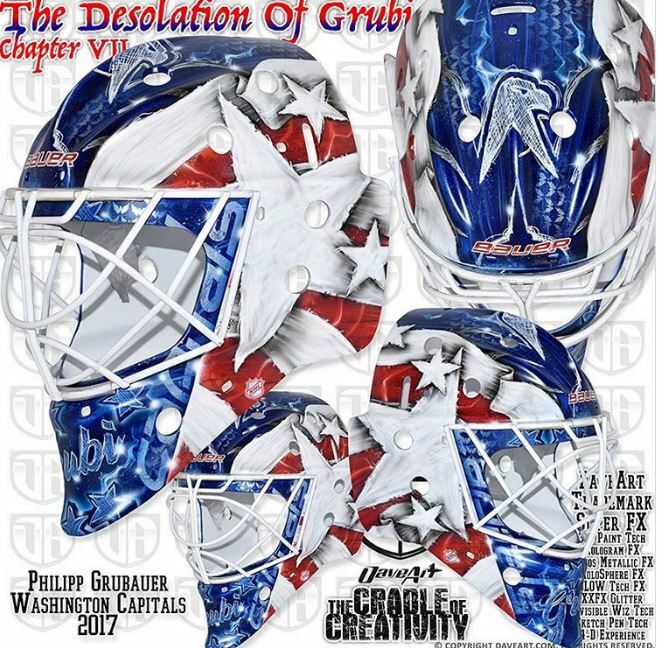 This season, Grubauer’s mask has been titled “The Desolation of Grubi” and combines a sketch pen rendering of the Caps’ Weagle logo with textured stars, stripes and Daveart special effects. 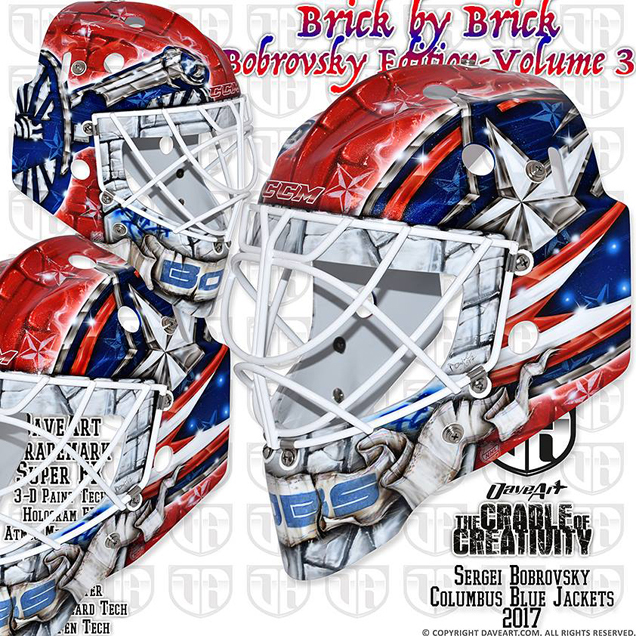 Bob’s mask, in its third edition with the title “Brick by Brick,” also jam packs the Blue Jackets’ logos with special effects, so who gets the edge? In looking at this level of minutia due to the many similarities, the branding on Bob’s mask has a bit more clarity and wins out by a slim margin. 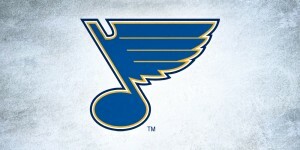 In a highly anticipated inter-state battle, last year’s Bucket Bracket champion has his hands full, taking on Brian Elliott in a battle of old school versus new. 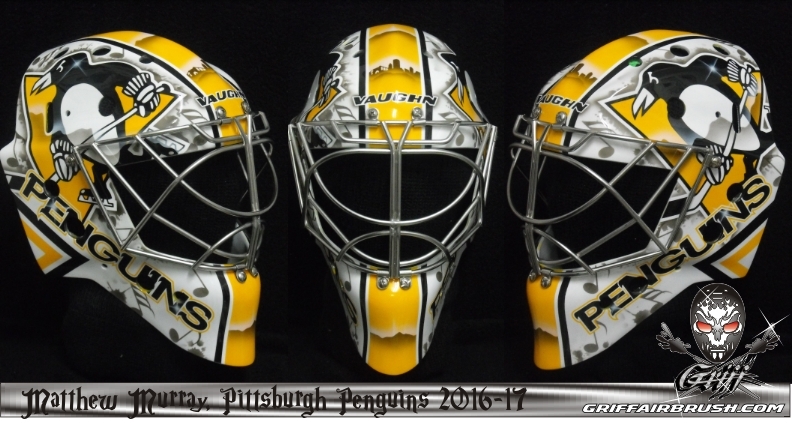 Murray’s mask, painted by Stephane Bergeron, has stayed the same for three seasons now, only updating the color when the Pens switched back from Vegas to Pittsburgh gold. The design is clean and relatively conservative, and while it doesn’t capture the retro flair of the alternate chevron mask Murray commissioned two years prior, it has a timeless look that allows the netminder to keep the same look season after season. 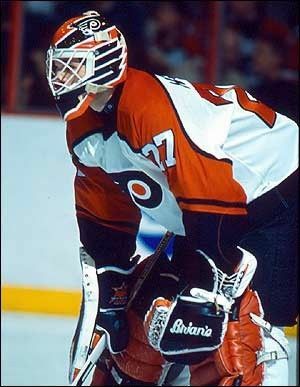 Speaking of retro flair, Brian Elliott’s Paintzoo mask by artist Fran Drummond pays direct homage to Flyers great-turned-GM Ron Hextall. 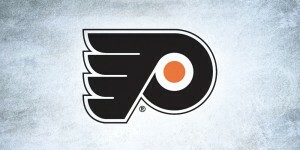 “[Elliott] told me he was a big Hexy fan, and really loved clean bold designs,” the artist told InGoal magazine. 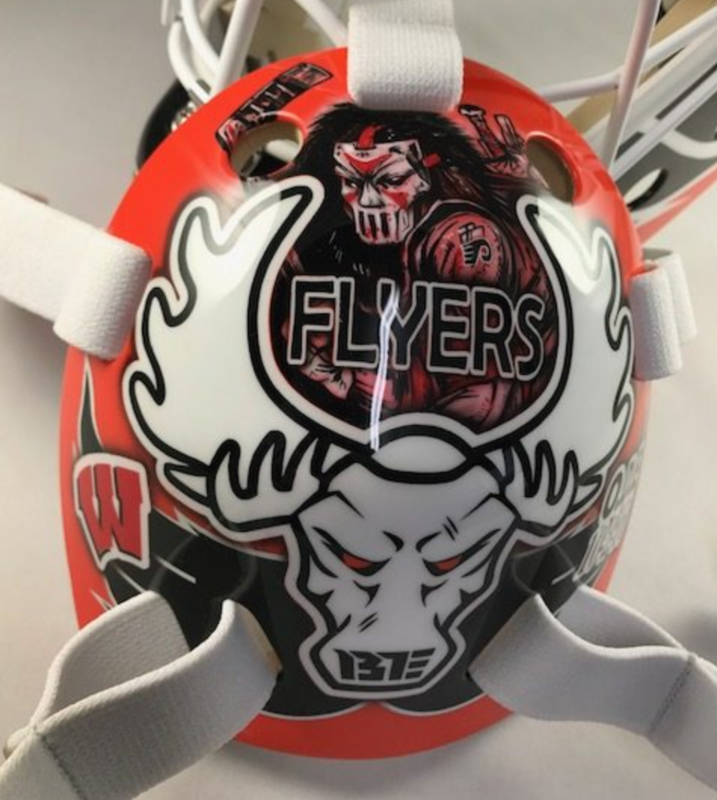 Drummond and his client put Elliott’s own spin on Hextall’s old school look, adding the goaltender’s initials on the chin and signature moose on the backplate. 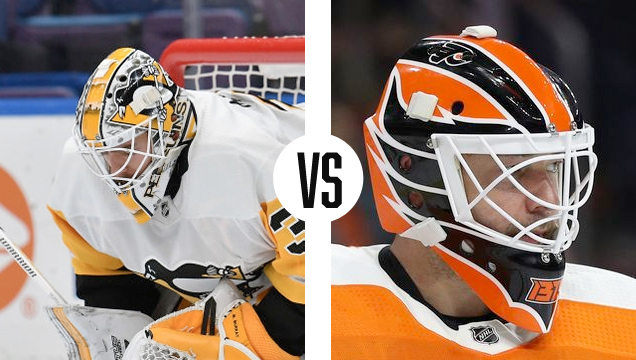 This is a tough battle for our defending champ, especially given my affinity for nostalgic buckets, so unfortunately for Pittsburgh, Murray gets bounced in the first round by Elliott’s graphic, retro flair. 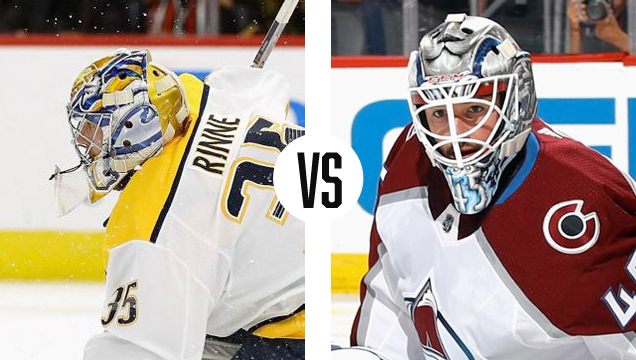 For our first western conference matchup, Presidents Trophy winner Pekka Rinne and the Nashville Predators take on Jonathan Bernier and the Aves. 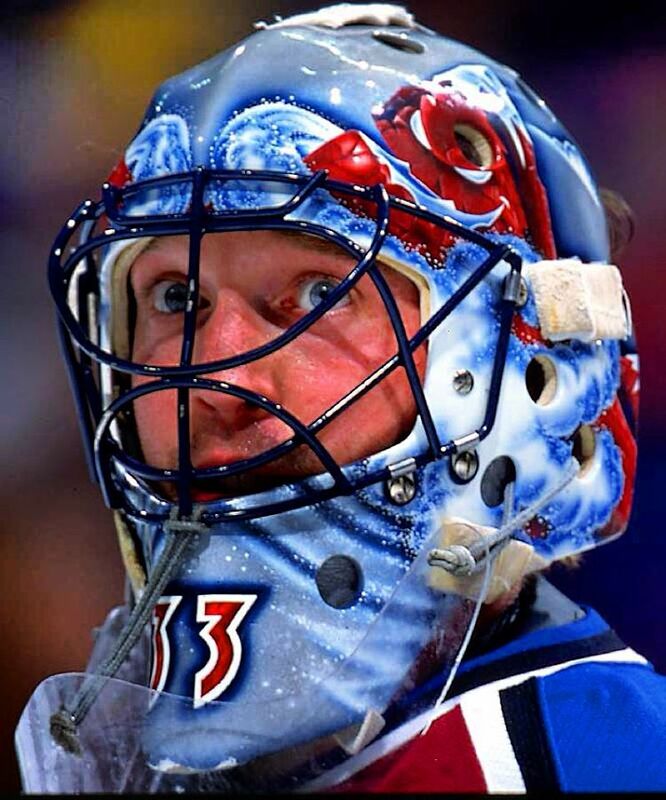 Both painted by Dave Gunnarsson, Bernier put his own twist on Patrick Roy’s iconic Colorado bucket, while Rinne strayed from his signature look with a different approach for this season. 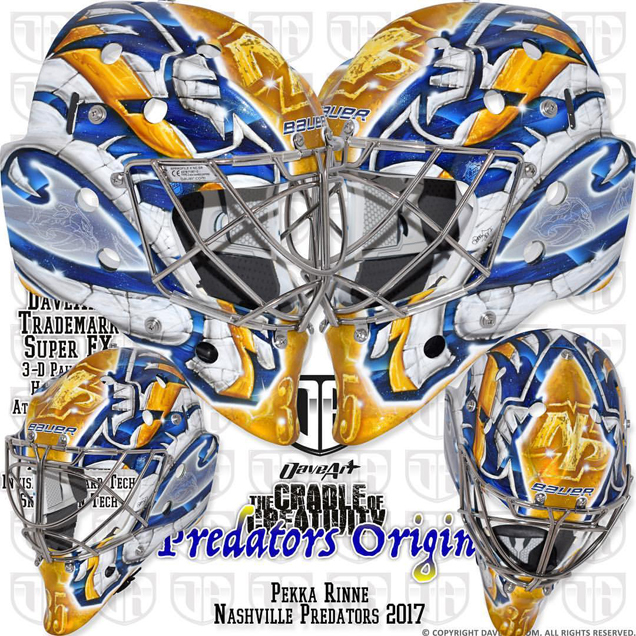 Of designing Rinne’s 2017-18 bucket after more than a decade of working with the netminder, Gunnarsson explained “this new design is built on the foundation of the awesome logos of Nashville Predators.” The focus on and placement of the logo create a more graphic composition, a vast improvement over Rinne’s cluttered movie-themed masks of yesteryear, although as we pointed out in our season mask preview, the omission of the team’s 20th anniversary logo seems like a missed opportunity. Across the ice, Bernier’s mask doesn’t do much for me one way or the other. While it’s far from one of the worst masks we’ve seen, it’s also pretty expected and lacks any unique design elements to make it stand out from the field. 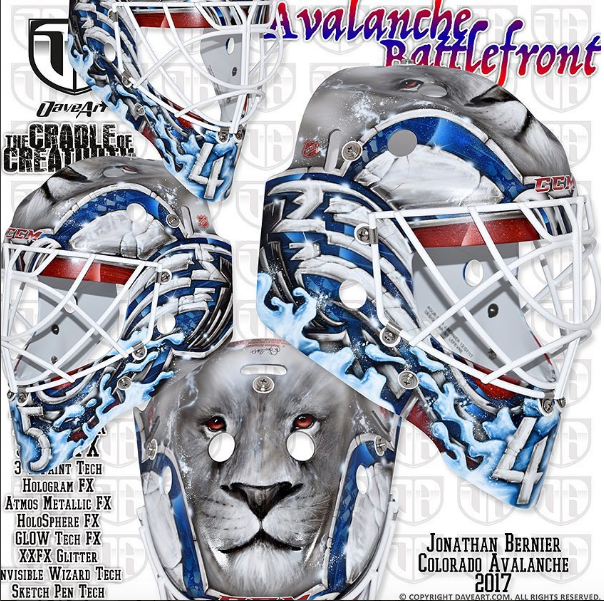 The lion as a centerpiece has been a mainstay on Bernier’s masks as he’s moved from team to team, but it lacks cohesion with the rest of the design and ultimately falls a little flat. The second matchup in the west pits Winnipeg netminder Connor Hellebuyck up against Devan Dubnyk in Minnesota. These goaltenders’ masks have drastically different styles, so let’s first look at Hellebuyck’s. Painted by Steve Nash of Eyecandyair, Hellebuyck’s bucket (say that ten times fast) makes great use of negative space, creating an optical illusion of sorts with depth and texture. 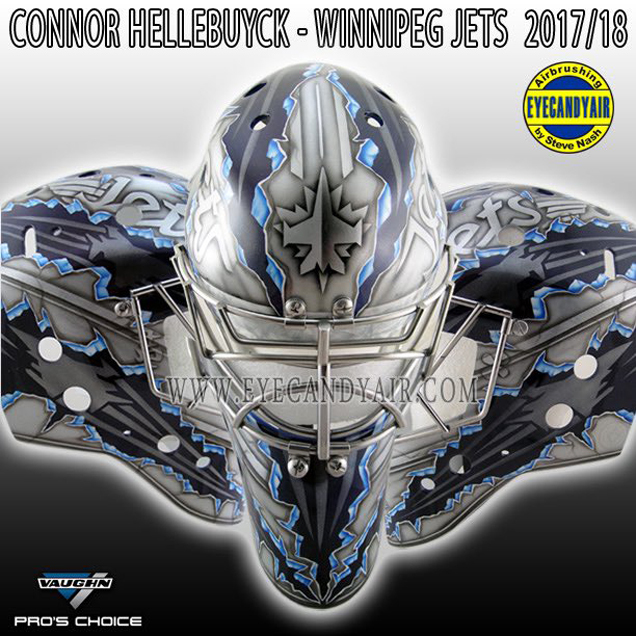 Having received an almost-perfect A- in our preseason mask preview, Nash’s creation for the Jets’ netminder incorporates the Jets brand in a really unique way, depicting silhouetted fighter planes in the negative space between dynamic and fierce-looking metal tears. Across the ice, Dubnyk has historically been known for his wacky giraffe masks, but this year, the Wild goaltender went with something a bit more traditional. 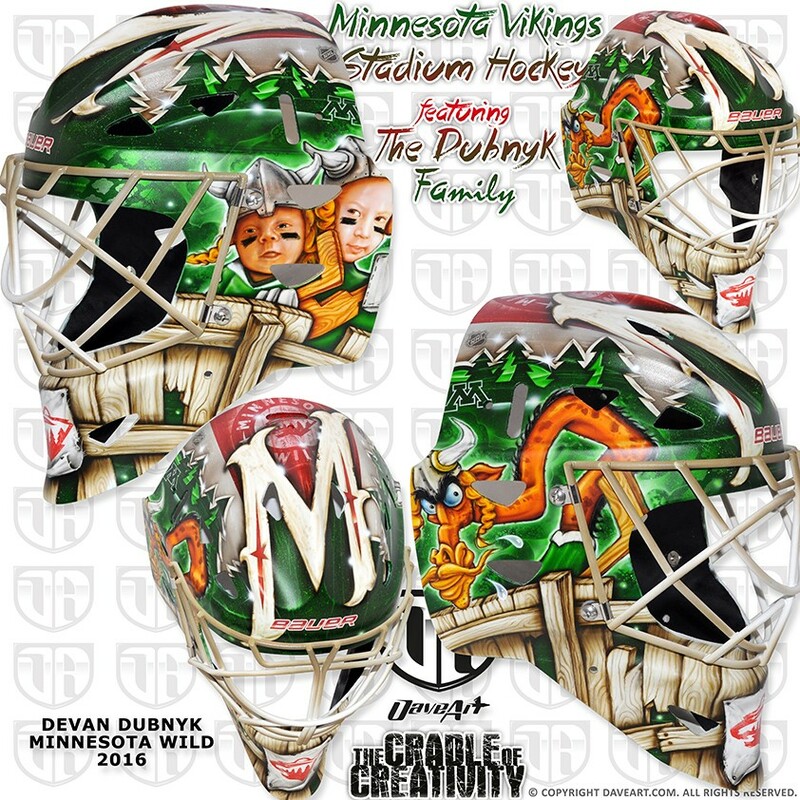 Dubnyk’s latest Daveart mask focuses more heavily on the team’s branding and includes a classic looking “DD” monogram lockup on the chin. In my humble opinion, this is a step in the right direction for Dubnyk, moving away from the more cluttered, cartoonish aesthetic to something cleaner and more timeless, but the dynamic and unique look of Hellebuyck’s still edges him out. Making their debut in the Bucket Bracket Showdown with a goaltender who is no stranger to the Stanley Cup Playoffs are the Vegas Golden Knights and Marc-Andre Fleury. 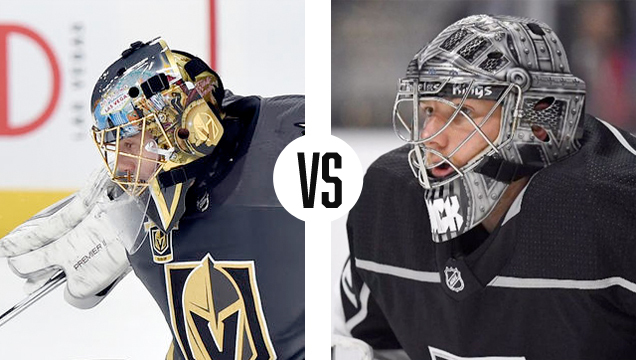 For their first go in the postseason, the Knights face off against another goaltender who has had his fair share of playoff success in Jonathan Quick. 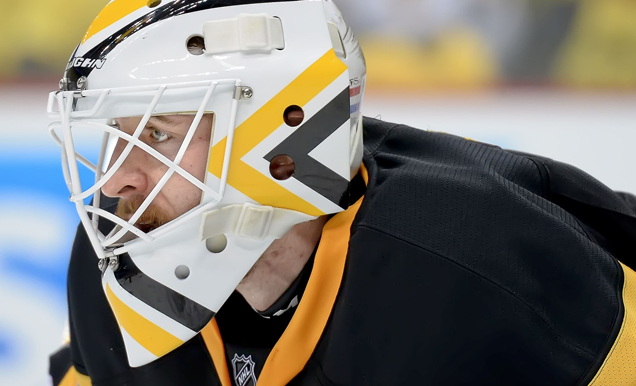 These two seasoned veterans have taken very different (although successful) approaches when it comes to designing their masks, so let’s break them down, starting with Flower. 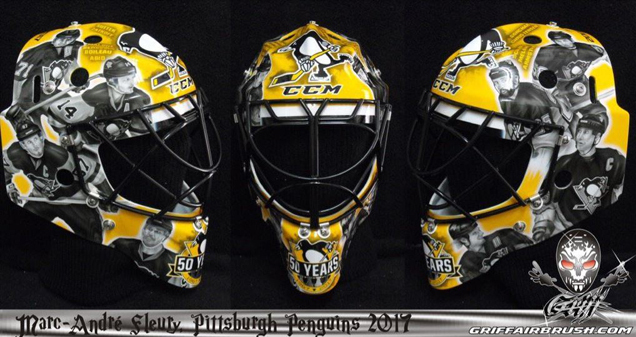 Throughout his time in Pittsburgh, Fleury was never one to stick with the same mask aesthetic for long. From retro inspired designs to tributes with realistic portraiture, Flower frequently changed up his look from season to season. 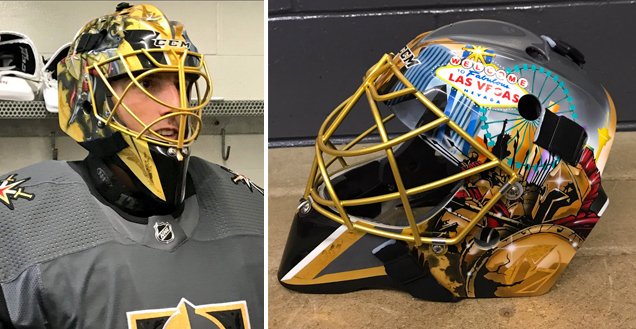 For his first year in Vegas, the goaltender and artist Stephane Bergeron fully channeled the location of Fleury’s new team with a gilded mask that was all Sin City. Using the logo as a divider down the center, the right side of the mask depicts a literal golden knight opposite a city scape scene on the left. The execution of the Vegas skyline is really beautiful, although the contrast in styles is somewhat jarring and lacks a sense of cohesion. 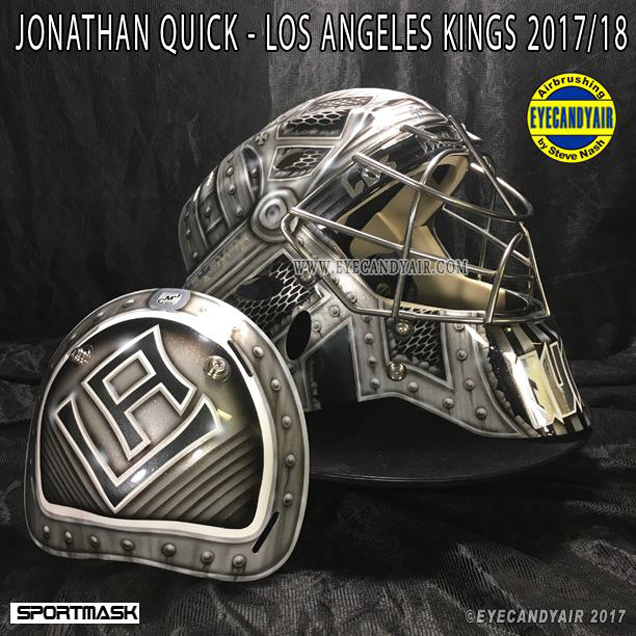 Jonathan Quick is perhaps the ultimate “if it ain’t broke…” goalie, keeping with the same battle armour mask concept for, well, as long as we can remember. The latest iteration by artist Steve Nash is very much in line with Quick’s recent buckets, using an all-silver color palette and metal textures to create a knight’s armour look. The grommets and mesh panels give a lot of dimension to this mask, and while the concept is nothing new or innovative for Quick, it’s another sharp mask that falls in line with his signature style. Fleury may have the Vegas flair, but Quick’s consistency and clarity give him the edge in round one. 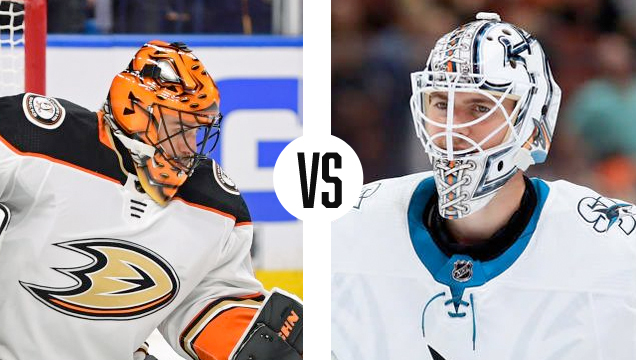 In the battle of California, Ryan Miller and the Ducks take on 2016 Bucket Bracket Champion Martin Jones and the Sharks. Both of these masks are really well executed and make excellent use of their team’s brand, so let’s take a closer look at each one. 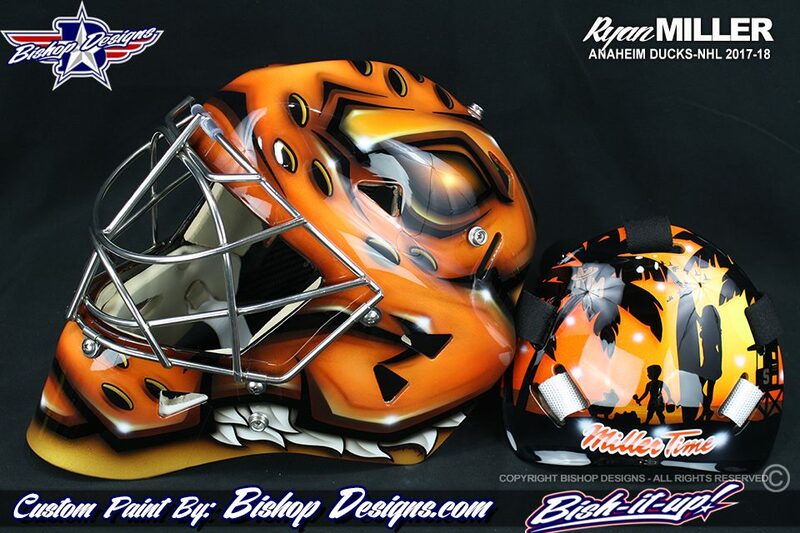 Ryan Miller’s mask, painted by Ray Bishop, transforms his bucket into the Ducks’ “mighty” logo, rendered in bright orange with duck feathers poking out from each side. 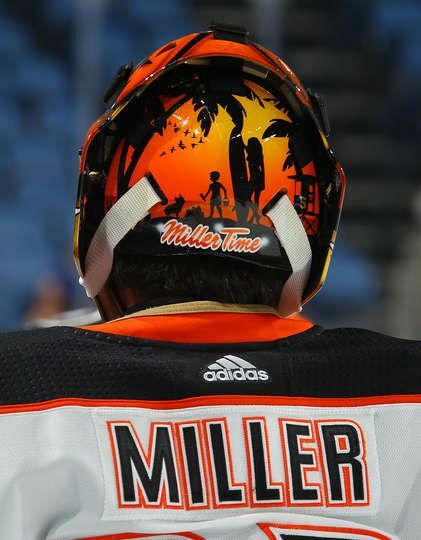 The backplate has garnered attention all season long for its beautiful California beach scene of Miller’s family that adds a heartwarming, personal touch while still maintaining a sense of cohesion with the rest of the mask. Martin Jones’ latest mask is very similar to the design that won him the 2016 Bucket Bracket crown, and while the composition is quite simple, the level of detail that artist Steve Nash puts into the design is really outstanding. 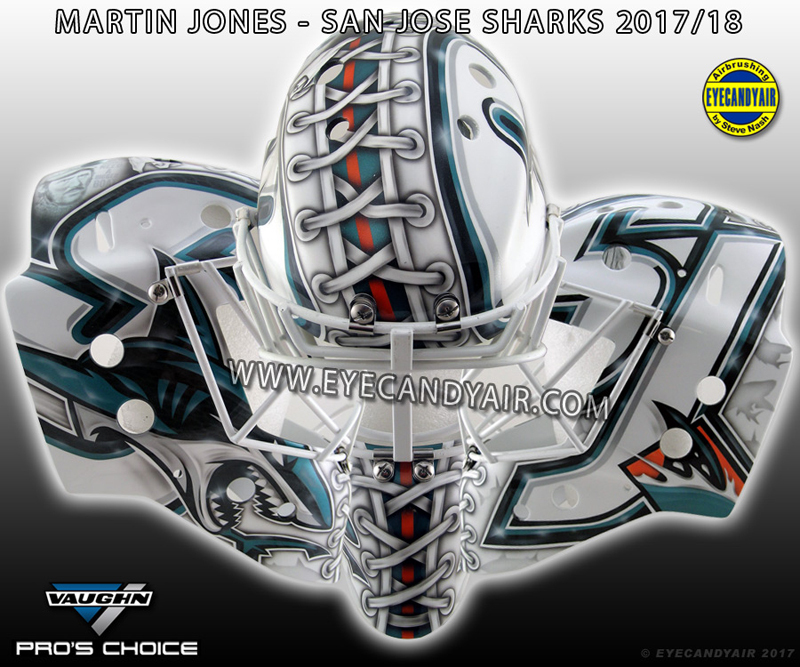 Stealing the show from the San Jose logos on each side, the laces all the way up the center of the mask are the standout design element and have become a signature for Jones. Both of these masks are really great, so it’s a shame to see one of them go in the first round, but the bold color and transformative nature of Miller’s gives him the slight edge. ICYMI, to help support the community of Humboldt, SK begin to heal after the tragic Broncos team bus crash, we are donating 100% of the profits from our Humboldt Strong design to the GoFundMe page set up for the victims and families impacted.